I thought that this class, the final type of Great Western condensing locomotives to operate on the Metropolitan lines (until the introduction of the 97xx class in the 1930s), and therefore Basilica Fields, was going to be an easy one to deal with, after all, the books and articles I’ve seen detailing the GWR’s presence on the Metropolitan line write frugally, but broadly in agreement, upon their role on the goods service from Acton to Smithfield…but scratch the surface, and the reality is not quite so clear cut. Built at Wolverhampton between November 1871 and April 1872, this class of twelve 0-6-0Ts were always Southern Division locos, and over the years some of the class were fitted with condensing equipment to work the Metropolitan lines. They were the first six-coupled engines to be accepted for the Widened Lines, some twenty years in advance of the much larger and heavier Great Northern saddle tanks. Steam on the Widened Lines Vol.2 p.10. Geoff Goslin. The name of this class [the 2-4-0T Metro tanks] is derived from the engines’ association with the Metropolitan Railway, over which so many of them worked, they being the only GWR engines to do so during the latter part of the nineteenth century. RCTS The Locomotives of the Great Western Railway Part Six, p.F29. Those with condensers were stationed in the London area for working over the Metropolitan line, whilst the non-condensing engines were mostly in South Wales, in the Neath Division. RCTS The Locomotives of the Great Western Railway Part Five, p.E34. 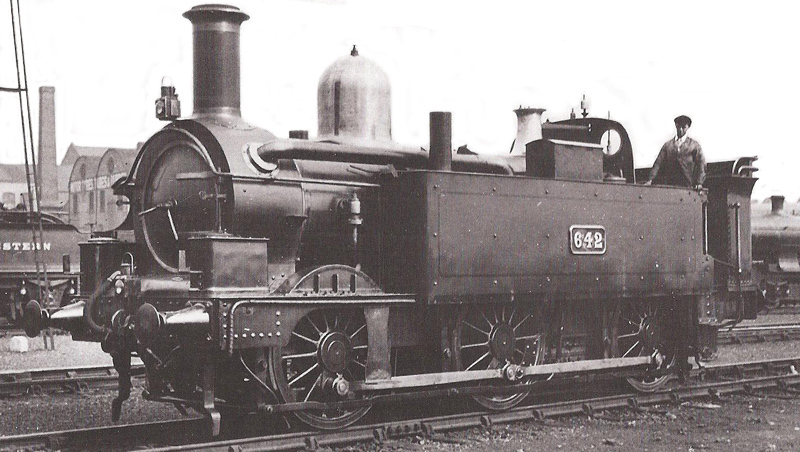 Condensing apparatus was fitted to 643/4 as built, but was removed from the latter in September 1884. RCTS The Locomotives of the Great Western Railway Part Five, p.E34. There are discrepancies in the accounts of those fitted with condensers at this period, but it is fairly certain that Nos.633/4/41/42/43 were so fitted when rebuilt or shortly afterwards and remained so. RCTS The Locomotives of the Great Western Railway Part Five, p.E34. The condensing engines remained without cabs until withdrawn in 1933-4. RCTS The Locomotives of the Great Western Railway Part Five, p.E34. 643 had always been a condensing engine. RCTS The Locomotives of the Great Western Railway Part Five, p.E34. N.B. * period of allocation indeterminate. In this instance, London Area means that an engine has been recorded as allocated to a shed within the London Division, examples noted include:- Paddington, Southall, Staines, Slough, Henley-on-Thames, Aylesbury, Watlington…. as far as I can see, there was no allocation to Reading, Didcot, Oxford. 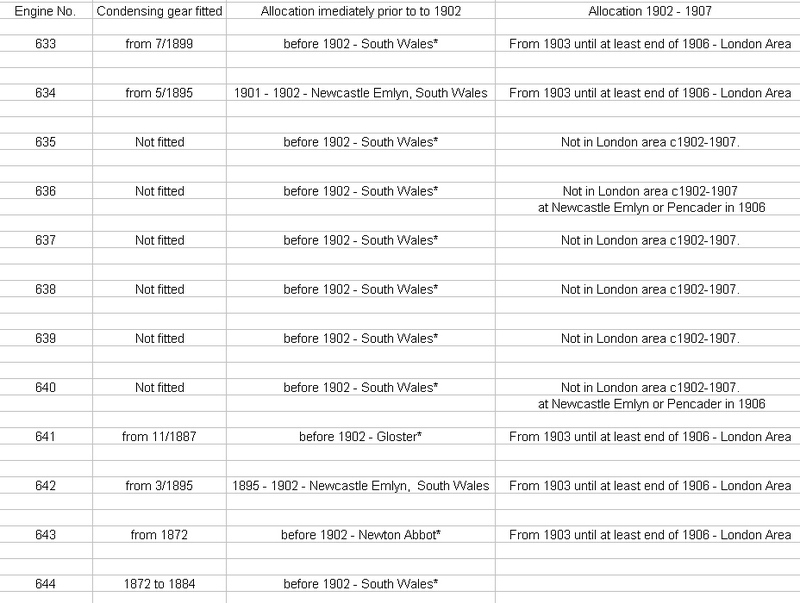 From this information, I suggest that the most likely candidates for your needs are 641, 642 and 643 which were Southall engines for most of the period from 1902 to 1906 and the most likely to be in charge of services over the widened lines. The Registers are in the National Archive, and the 1902 Register can be found at RAIL 254 / 60. I’d like to thank John Lewis at this point for supplying digital copies of the relevant pages via Graham. The photo of 642 is irresistible, and places it in London in pre-1906 livery, so spot on for the later period of Basilica Fields. I’ve an old Mega (ex-Gateneal) kit of the 633 class, but I suspect that most of it will be binned – not necessarily because of any fault in the kit itself (though it is verybasic compared to modern offerings), but because it represents a much later version of the locos with different side tanks and enclosed cabs, and scratchbuilding looks increasingly likely. 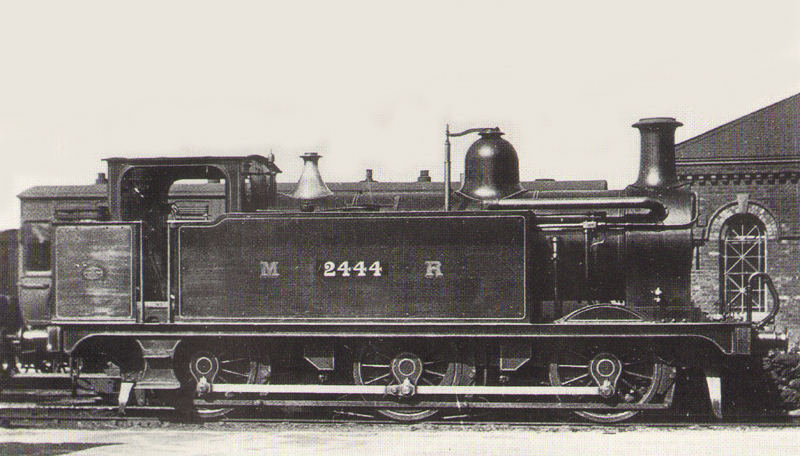 Midland locos pt.4: Johnson’s 2441 class. In 1899, Johnson unveiled the first of what would become a class of 60 new goods tank locos, the 2441 class. Descendants of the 1102 class and antecedents of Fowler’s 3F ‘Jinties’, the first thirty of the class had condensing equipment from new for working the sub-surface lines in London between the various goods depots, and carried various detail differences which separated them from their normally aspirated sisters. To counter the side tanks from being blistered from the very hot water passing through the condensing pipes – a problem encountered on other lines, for example the Great Eastern – an outer skin was fitted to the tank sides with a small airspace between. This arrangement produced a squared front corner to the tanks with pairs of cooling slots on the front edge, whereas the normally aspirated locos without the outer panel had rounded tank corners. Those allocated to London were initially painted and lined in the highly decorative ‘London style’ of crimson lake with almost everything above and below the footplate lined out. No. 2444 is seen here on 6th June 1903 at Cricklewood in just such a livery, and despite appearing at first glance to be in ex-works condition (a misused phrase so beloved of authors of books and magazines), it instead bears the marks of hard work on the Widened Lines; traffic dust and grime haze over the wheels, underframe, valence, bunker and tank sides – the numbers have had attention from the tallow cloth to make them appear clearer, and there are signs of a hot smokebox and chimney too. It’s worth noting the slightly shorter boiler fittings, especially the chimney and dome, and especially the arrangement of the Salter valves, with the pillars attached to the sides of the tank rather than the top of the boiler. This is the second instalment seeking to précis the Great Western Railway’s Metropolitan tanks on Middle Circle services. The first part dealt with a little history and the Medium-sized Metros, and here I’ll deal with the large-tank series. In January 1899 the first of twenty new Metros was released to traffic with large 1100 gallon tanks. Volute springs replaced the leaf springs over the leading axleboxes due to space considerations, and following on from the previous Lot of Medium Metros in 1894, the new locos were all built with the dome on the back ring of the boiler. One month after the introduction of the larger tanks the first of thirty condensing Medium Metros was sent to Swindon to be given larger 1080 gallon tanks, and by the end of the year there was a total of fifty large condensing Metros in service for Inner London traffic. The final decade of the 19th Century and the first six years of the 20th were the busiest for the condensing members of the class in the City; single-handedly they dealt with through services from the main line to Aldgate, the Middle Circle services from Mansion House via Earls Court, Addison Road, and Bishops Road to Aldgate, half the trains on the Hammersmith & City service to Aldgate via Bishops Road, and most trains on the Aldgate to Richmond via Bishops Road, Grove Road Junction and Gunnersbury, and of course the Extended Widened Lines Services to Basilica Fields. From 1900 the Middle Circle service was cut back from Mansion House to Earls Court, and in 1905 trimmed again to Addison Road. Electrification of both the Circle and the Hammersmith & City in 1906 prompted the first withdrawals of the class, and stripped all bar six of their condensing apparatus. 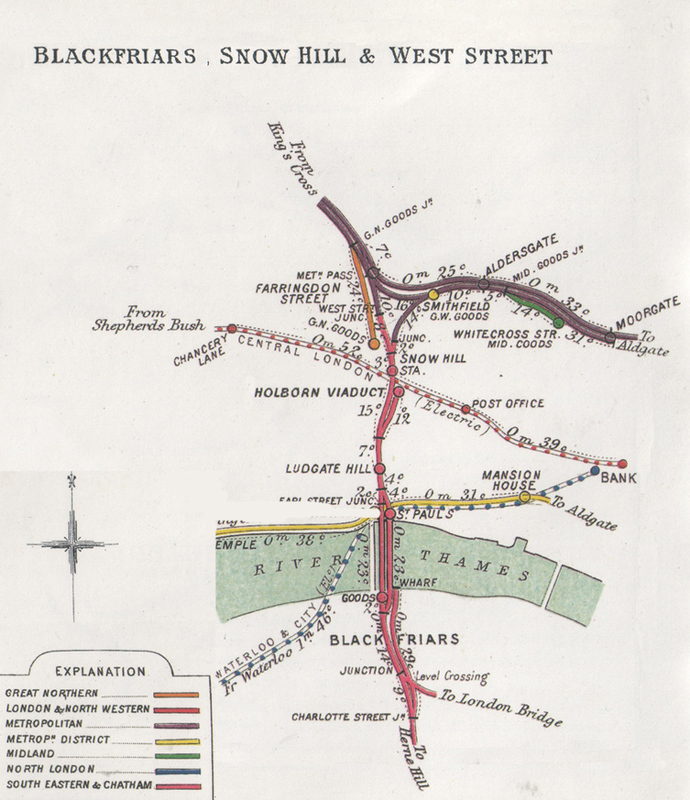 Limited services continued on the Extended Circle to Basilica Fields until 1913 when that line was electrified alongside the East London Railway. 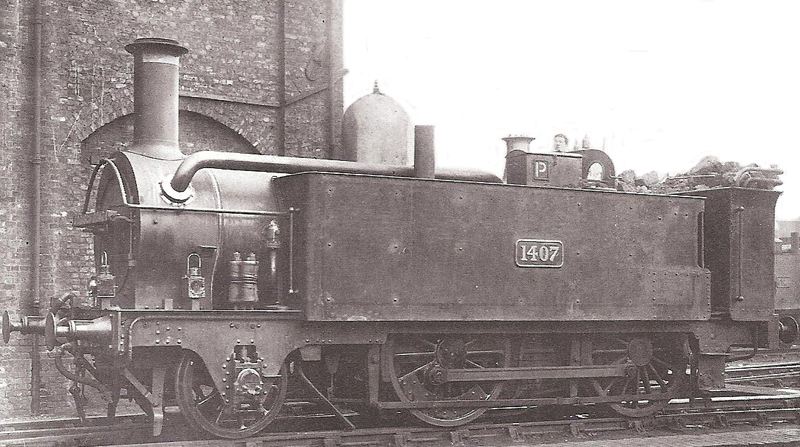 No.1407 was released to traffic in June 1878 as a medium Metro to Lot 47. 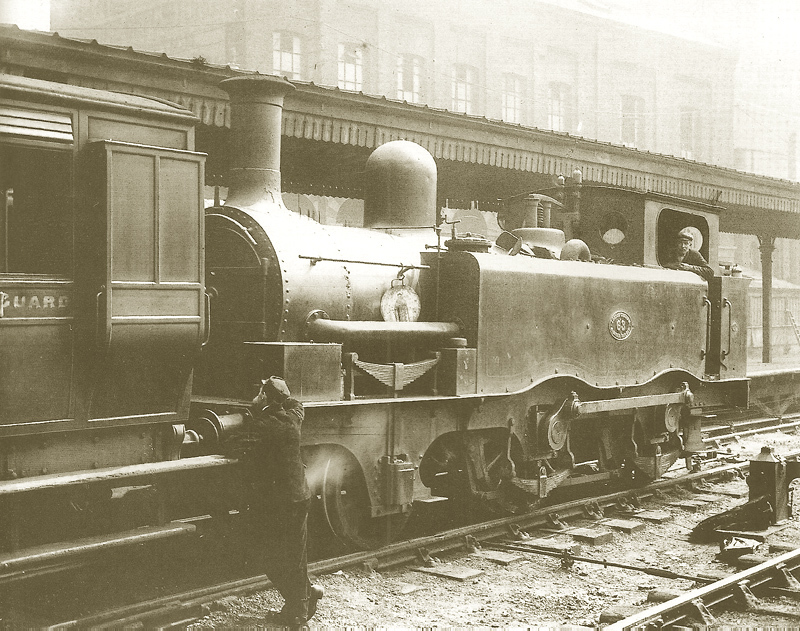 In June 1898 it was reboilered, given large tanks and volute springs, and is seen here sometime between 1898 and early 1906 stationed at Paddington. The loco is heavily stained and weathered from working in the Metropolitan tunnels, and shows that even the proud Great Western in the pre-Grouping era wasn’t as shiny and sparkly as many modellers presume. So far I’ve discussed the Basilica Fields project running c1890-1898, and I’ve already admitted that this is quite a big timeframe to deal with, especially as it is one in which a great many changes took place. However, dealing with so many railway companies and a very incomplete historical record when taken as a whole, I’m left with little choice, and it has proven impossible to narrow things down further. Even with this very large window in time of almost a decade, there are still gaping holes where I’m simply going to have to make a best guestimate based upon the information and advice given to me by those who are well respected in their areas of historical railway knowledge. Nevertheless, despite the pitfalls, 1898 isn’t the end of the Basilica Fields story, and I also intend to run a 1899-c1906 period. Again, this is very feather-edged with no delineated start or cut-off point, and like in the earlier period there will be times when there will be anachronistic pieces of stock running…but not in the same train. ‘Why?’ is a very legitimate question, and is one which I’ve been asked more than once. The answer is simple; the last decade of the 19th century saw the pinnacle in artistic locomotive and stock design, and one which contrasts with the early years of the 20th century when there was a move towards more powerful looking designs. It’s a fascinating change, and one of the big advantages of modelling such a wide timeframe – indeed, one of my earliest ideas, and something that I kept coming back to when planning all of this – is the opportunity to show not what the railway looked like at a certain date, but to show the changes that took place over a period of time. Few modellers have attempted anything quite so daft, and to be honest, I now know why! Graham’s comment about couplings sent me scurrying off to the book room to look for more info. Far from finding definitive answers, I’ve found that coupling types in use during the period were legion; three link, four link, five link, three link plus one for shunting, links (of different numbers) with a hook (sometimes short, sometimes long) on the end, short links, long links, short pilot screw links, long screw links, side chains (with different numbers of links), and more besides! As for the coupling hook, there were Gedge hooks, plain hooks, some locos had an an eye-bolt and no hook! Solid hooks, swinging hooks, ad nausium. Even more hair-raising was that different members of the same class on identical duties could have different coupling types, and some locos wore two or even three types of coupling at once. Sometimes these multiple types were hung loose over the hook, sometimes they were attached to a common hook (or eyebolt). Mad. Just mad.